I thought I would share some of my favorite products for 2011. Some of these are new to me for 2011, and some are my go to brands. Some of these I learned about through this wonderful blog world. I'm sure I've mentioned, I'm not a shopper. I also have a tendency to save dollars and go the cheaper route. For example, just a few years ago, I WOULD NEVER have spent $54.00 on a pair of shorts. In fact, I thought $20.00 for my first Nike Tempos was crazy, and my first pair of $10.00 socks almost sent me over the edge. As my mileage has continued to go up and up over the past few years, so has my willingness to pay for comfort and quality. blogged about the Lucy.com birthday celebration offering 25% off. She mentioned the tights being great and cheaper than lulu. (yay - I ♥ cheaper) I decided to try the following items at 25% off. We've had a couple of "tight" days , and I've finally been able to give the tights a few test runs. Let me say, AM was CORRECT! I have a new love..... Lucy tights! As for the Lucy shorts......lulu is still tops on my list. The shorts are comfortable, and great for shorter runs, but on longer runs, I have some chafing with the Lucy shorts. So for me, I would opt for my cheaper Nike shorts for the shorter runs over the more expensive Lucy shorts ($44.00 regular price). I do like the material and the fit of the Lucy shorts, but not a winner overall for me personally. other notes - the back zipper pocket is small and no front pockets for gels. if you read the reviews - many say these shorts are chafe free for them, so maybe they would work for you. At $24.99, maybe worth a try if you need new shorts. (As I'm writing this review, The Docs have a show about "The Pink Method" has anyone tried it??? Adidas Cushion Response 17s. Adidas is now on 20 or 21. I have a few more pair of the 17s and then I have to find a new shoe. (boo!). I had a pair of the Adidas Cushion Response 19s and they are hard and NOT the same. I suppose my first trial will be the current model. I seriously HATE these expensive trials and so far mostly errors. I go through shoes quickly with my mileage, and I hate trying shoes that do not work for me. Currently, I added a pair of Brooks Glycerins 8s, to my 4 pair rotation. A $90.00 fail! Ouch! I'm still wearing them, but each run, I DO NOT like them. They are hard! I like my cushion! My best tip concerning shoes - just in case you are new to my blog - I rotate 4 pair of shoes at a time. Before starting the shoe rotation, I was LUCKY to get 400 miles on a pair of shoes. Most of the time at 350 miles, they needed to be replaced. Now with rotating each day, I can get between 500-600 miles. Yes, the initial investment is large, and keeping up with the mileage on 4 pair of shoes IS a PAIN, but overall, I save a lot by being able to get an extra 100-200 miles on my shoes. For me, it's worth the extra effort to save $$s. **Garmin 305 - I'm old school but I like the the data of the 4 blocks on the screen, and from hearing other runners talk about the bezel on the newer models, I feel like me and the newer models would have "words" often. **Ipod Nano - I'm not a fan of the latest model but it's a necessity for me to have my Ipod. (it's a big part of my joy of running) I dislike not having an on/off button, and I preferred the buttons to go forward/backward from song to song. I do not like having to look at a touch screen to do what I want to do. In addition, I sweat a LOT, so I'm not long into a run when I no longer have control over my tunes because my fingers are sweaty, and the touch screen will not work. Boo Apple! Please make an Ipod for sweaty runners. For hydration - I have several different options, for different mileage days. This year, I have really enjoyed my Camelbak for longer runs. I grew weary of dropping waters, and now the only time I need to go out and drop is for my long runs that require extra water, or when I need Gatorade, etc. I have the Camelbak Snowflake(for women) , which may have been discontinued. This one was recommended by K. over at HappyTrails. They have sense tried some different models and they do a lot of trail runs requiring hydration so they are a wonderful resource. Also, check out The Running Artist. She runs with a different model and has a review of it on her blog. I also use a "Fuel Belt" for medium distances. It works well and tightens down comfortably for running with no fiddling with it required. For short distances I have a handheld, similar to the bottles in the "Fuel Belt", but it has a handle to slip your hand through, making it easy to carry on the run. I will say all of the options do take a little adjusting to, but I did find that I quickly adjusted to each option. I want to/do NOT want to, try some of the lululemon tops. I fear I will love them and then my $12-$18.00 running tops will be out. So far, I've resisted, but 2012 may be the year for another new splurge. Thanks for sharing the products you love on your blogs. I find it very helpful and has been very reliable so far. Keep them coming for 2012 please! I'm heading out for a run/walk. I have a few more miles that I want to complete before the end of 2011. On Tues.of marathon week, the low was still predicted to be 40, and I told Chad I was going for a BQ (Boston Qualifying) race. Let me tell you, I was "feeling it!" Most of the time, when I get this feeling, my goal is met, IF the weather cooperates. Well, if you've been reading lately, you know the weather did indeed change to the warmer side. 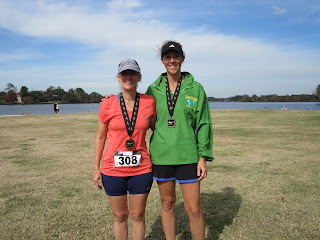 After consulting with Chad (my hubby), and getting some SUPER feedback from blog world, and local friends, I decided to go for a PR (sub 8:45 avg) race. With the low of 50 and a quick warm up, I definitely decided against the faster BQ race (8:35 avg). I had not vocalized or written about the BQ attempt to anyone but Chad. Jen and I headed down to Baton Rouge Fri am. We had a quick "chatty" trip. We stopped in Mandeville for lunch at the Olive Garden and then zoomed on to Baton Rouge. We took a ride around most of the course, went to dinner, the expo, and then we went to bed early. Smooth sailing and ready for a PR race. Woo Hoo! I was actually so excited about the race, that I was worried that I may not be able to sleep. I went right to sleep and rested well. Everything on track for a great day. We were able to park within a 1/2 mile of the start. We waited in the car for a while, and then we walked to check our bag, potty line, quick chats with other runners, and we're ready to start. Jen and I wished each other good luck and a good day, and we're off. I had this in a nice, readable format and blogspot randomly messed it up. I decided to leave it, as is, because it's really how I ran on Sat. I was all over the place with pace, I couldn't get on a pace and maintain it. I was constantly too fast, or too slow. slow again, but I'm still ok - get on pace! Prior to the race, I had looked at the map and knew the course had many turns in it. I had to run the tangents really well to have a good race. However, in addition to the turns, the course also has a lot curves as the road meanders around "The Lakes:, near the LSU campus. Until late in the race, I stayed at +.06 which, excited me. I'm guessing that I zoned out a little on the tangents when the stress of my slowing pace elevated. As you can see, I ended up with and extra .15 on the day. Bye Bye PR! After the race, immediately my feet and legs felt like they would cramp at any second. I made it over to the water and powerade and started refueling. I wasn't in the mood, but I decided to eat some jambalaya (LA rice, etc). I knew it would be salty and hoped it would help. A few minutes later, I was going to for more water. I stepped up on a curb, and just like that, my leg was stuck, with my heel in the "UP" position. I could NOT move. It took a while, I bent over, and rubbed my leg, and finally I was able to lower my heel to the ground. It's now, Tues. morning and my left calf feels much better. It's still sore, but fading. I took and ice bath Sat. night. On Sunday, I rested most of the morning with a nap at 9:30 am, yes I said a nap at 9:30 (much deserved). Sunday afternoon, I met Kelly and we walked for a little over and hour. When I finished walking my calf was totally loose and feeling good. By the time I made the drive home, tight and sore again. I took an epsom bath. I do not know much about Epsom baths, but some people swear by them, so I tried it. If you have studied, or have experience with Epsom baths, please educate me. Not sure if it helped, but the soaking in the warm water felt good either way. Monday am, I went to a yoga class - same thing - totally loosened up, and then later sore and tight again. Monday night, I walked on the treadmill for just over 30 minutes and it felt fine. **I felt really good all the way up until mile 23. Usually I start feeling bad anywhere from 16, to 18, but definitely by mile 20. This is huge progress! Excited! **Had the last hour been in the 60s, instead of the 70s, I KNOW I could have "held on". **usually when I "fall off the pace" - it's a much larger "fall off" than the decline on Sat. **I loved the Baton Rouge Beach Marathon - it's a great course, scenic, well organized. It has a few minor rollers, but most of you would call it flat. **I was expecting the humidity to be much worse, but the gentle breeze helped. **Jen ran a PR race! Woo Hoo! I went for it ! Congrats to Jen! She blew her old PR away by 4.5 MINUTES. She went into the race with no plans to PR, and walked away with a super race. So proud of you Jen! but I ended up leaving Baton Rouge without a BQ, and without a PR. I would be telling a lie, if I said I wasn't disappointed, who wouldn't be when you miss a marathon PR by 15seconds, but this is the narrative of the rest of today's story. Overall, I'm pleased with the outcome. I left everything on the course. My PR is at St. George (downhill course). Baton Rouge is what I would call a "fair course" with some rollers, (some call it flat). After my PR / BQ at St. George(2009), my goal became to BQ on a "fair" course. Let me say, I do not discount the St. George, downhill course for a BQ, but this was just my next step, my next goal. So today, I made that goal to BQ under the old standards - looking on the bright side. Unfortunately, for me, the old standards mean nothing. So, overall, it was a good day. Thanks for checking in and supporting me. It means a lot to me. to all who posted, or sent email responses. I appreciate the thoughtful answers. I read and re-read, and re-read them. I'm excited, I've prepared better than ever, and I'm READY! I'm going out on pace, and will see what the weather does. I'm hoping this plan holds, and I'm able to leave everything that I have on the Baton Rouge course. If you want to share your favorite mantra or affirmation please do so. Have a great weekend everyone, I know I will. Go everyone racing this weekend. (interesting note: the first day the weather report warmed, Chad (my hubby), said exactly what the majority of you said. (before my freak-out post - ha ha) He also mentioned the fact that I've been running better this fall, in the warmer conditions, which is true.) Reinforcement is nice! Yes, I'm freaking out. It's marathon week. Sat., I'm scheduled to "all out race" The Baton Rouge Beach marathon. The low this morning was 27. Most of this week, the prediction has been a low of 40 degrees on Fri. night. I've been so excited, feeling super about it, and READY to RACE. Yesterday, BAM - the low changed to a low of 50 degrees for Fri night. So 7:00, 8:00, and 9:00, I would be fine, but "my race" starts around 9:30 am. So I've already gone through the panicked search for another marathon. My best other option would be Jacksonville, FL Dec. 18th. So now I must decide and would like your opinion. I have worked so hard for this one. I stepped up my training to the next level. Everything that is in my control has been right on target. what to do?, what to do?, what to do? 1. go ahead and "race" Baton Rouge 26.2, and give it all I have, knowing the weather will impact my time. 3. race the half, and go for that PR - first 2 hours will be PR doable, I think. Ok, I'm going for a run and maybe some focus and answers will be found on the run. "Breathe Ginny Breathe!"